3x3 TANALITH Extra fence post 8ft treated in Green. We recommend that if you are going to use wood posts then try to use 4x4. 3x3 TANALITH Extra fence post 8ft treated in Green. 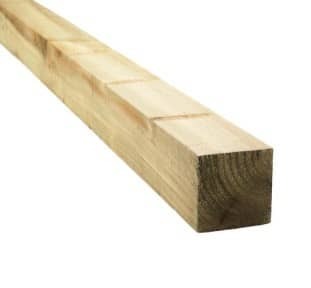 We recommend that if you are going to use wood posts with your fence then use 4x4 fence posts, To be used with a 3ft fence TANALITH Extra is an effective water repellent additive that can be used with TANALITH wood preservative within the treatment process. It gives an added built-in weathering protection to the treated timbers. TANALITH Extra treated timbers have all the same preservative protection properties as TANALITH treated timber. The water repellent also helps maintain the dimensional stability of the treated timbers.